Boasting the country's largest selection of South Island food, drink and kitchen equipment suppliers, The Food Show Christchurch is a one-stop shop for food inspiration. A packed schedule of renowned chefs are lined up to provide world-class cooking demonstrations at the Whirlpool Cooking Theatre with the likes of Chelsea Winter, Ray McVinnie, Sachie Nomura, Peta Mathias, Annabell White and Dish's very own Jonny Schwass on the bill. Over 100 exhibitors will be in attendence, showcasing the finest in food and wine produce. 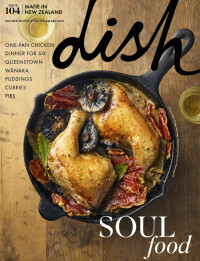 Look out for the Dish stand and snap up our special subscription deal and gourmet goodie bag! For more information and to book $20 adult early bird tickets, visit www.foodshow.co.nz.